Helping your kids to make their own Valentine Cards is fun and rewarding, and of course the cards mean so much more to the recipient ... the perfect Valentine Day crafts for kids! We have suggestions here for all ages and abilities, and many can be made very quickly if it is necessary for your child to take cards to school! This is a good card making technique for kids to use for all sorts of occasions. We have made a flower card, but you could use a heart for Valentine's Day, a Christmas tree for Christmas, and so on. Who would have thought that a simple piece of kitchen foil could be turned into such a special Valentine's Day card! This is one of our quickest Valentine's Cards to make, but it can be a fun tracing, cutting and pasting activity for younger kids. Older children could cut through several layers of fabric to make Valentine cards in bulk! Have some sculpting fun with this fimo hearts card. This one is better delivered by hand, but if you are going to post this card, we suggest using a padded envelope! Children can have some messy fun making these fingerprint flower cards - perfect for Mother's Day or Valentine's Day. Very quick and easy, this glitter glue Valentine's card is personal and cute! This Glittery Heart Card is a quick and easy - but very effective - Valentine's Day card for kids to make. These home made Valentine's Day cards are really pretty, and simple for kids of all ages to make themselves. The picture doesn't do these cards justice! We found these lovely large sequins at the local craft store and snapped them up! With them we have made some very pretty, but simple, home-made Valentine's Day cards. 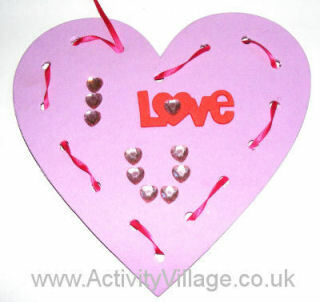 Your children can make some very pretty home-made Valentine's Day cards with a small supply of beads and some imagination! The finished card is so pretty, I wish our photos did it justice! Swirling the paints around on the paper plate to make the marble effect on this Valentine's Day card is great fun, and it does mean that the paint is relatively easily contained. Here's a quick technique that kids can use to print valentine cards. Even the youngest children will be able to have a go at this idea. Make just one - or one for every member of the class and family! This rubber stamped card is a super project as it involves designing and creating your own stamp, and then the fun of printing the cards too. A good way of making lots of Valentine's Cards! This stripy heart card is so simple to make that even the youngest children will be pleased with the result - but it looks fabulous! Suitable for the youngest kids, this is messy cutting and sticking fun! This tissue paper printing technique is a very quick method of printing a Valentine's Day card - and we think you'll agree that it works well! Perfect if the kids want to make a big stack..